The Shaniwar Wada was the most magnificent and stately mansion that was ever built in Poona by the Peshwas in the 18th century. The foundation stone of the building was laid by Bajirao I (1720-1740) on Saturday, the 10th of January 1730, being an auspicious day. On this occasion, according to state records, Rs. 1-8 Anaas, were spent in charity. There is an interesting legend about the site selected for this historic building. While riding over this ground, the Peshwa Bajirao saw, to his great astonishment, a hare chasing a hound, which struck to his mind that there must be something very auspicious in this place, where a hare forgetting its natural timidity boldly chased a dog. He at once resolved to secure the site and build there a house for himself and his family. At that time, this piece of land was included in the ' Kasba ' or village of Poona which was enclosed by a mud wall. It contained only a few huts of fishermen and weavers, from whom Bajirao acquired five acres of land by exchanging with them suitable sites in Mangalwar Peith and commenced the building rapidly. Within an interval of two years, a two storeyed Palace with three quadrangles sprung up to be the focus and centre of all the life and movement of the Maratha power. The opening ceremony of the Palace was performed according to Hindu religious customs on Saturday, the 22nd January 1732, when Rs. 15-8 Anaas, were paid in charity to Brahmans. It is stated that the total expenditure incurred on this Palace came up to Rs. 16,110. As conceived originally the plan of the Palace was very simple and elegant and only the Diwan Khana or the main hall oi audience contained some ornamental carvings. It was the third Peshwa, Balaji Bajirao (1740-1761), who made several additions and alterations, and added much splendour and beauty to this fine mansion. He devoted his store of knowledge as well as money and patience in turning out this edifice to be an object of great delight and admiration. Later on, Nana Phadnawis, Prime Minister to Sawai Madhavrao (1774-1795), constructed a few more rooms and halls, galleries and towers, pavilions and fountains, and made the royal residence truly majestic and grand, worthy of the great rulers of Maharashtra. The Palace was destroyed by fire in 1827 and now there remain only the fortified enclosure wall, and the five gateways, and nine bastions. It is therefore impossible to form a correct idea of the actual building which existed in the heyday of the Peshwa's power. The foundations of the Palace and various other buildings in the extensive compound which covers about five acres of ground have been recently unearthed by the Archaeological Department. They give us a faint idea of the original plans of the building but no picture of the real magnificence and greatness of this royal mansion. It is said that only one mirror-hall survived the great fire of 1827, but that too was scattered owing to the want of historical interest in these days. It is only latterly that Government have been taking great interest in the preservation of objects of historical and archaeological interest, and thanks to H. E. Sir George Lloyd, whose genuine interest and wonderful energy have enabled us to see the old foundations and remains of the Peshwa's Palace, which were buried under heaps of debris for nearly a century. The main building of the Palace consisted of six storeys and it is said that the spire of the Alandi temple could be seen from the uppermost terrace of this building. Sawai Madhavrao Peshwa used to enjoy a beautiful view of the Parvati temple and of the city from the terrace of his Meghadambari room, and often spend evening hours looking at the stars in the sky through a telescope which was presented to him by Sir Charles Malet, the British Resident at his Court. The height of the main building can be imagined by the height of the existing Nagarkhana (music gallery) from the of which the royal standard of the Peshwas waved proudly day and night. The main entrance to the Palace is known as Delhi Gate as it faces Delhi in the north. Raja Shahu of Satara told Bajirao I, not to put the main entrance to the north as it would mean a disrespect to the Mogul Emperor of Delhi, whom Raja Shahu held in great respect and to whom he acknowledged his allegiance. In deference to the wishes of his master the Peshwa stopped the work ; and the present massive gate which still indicates the former greatness of this Palace was the work of Bajirao's son, Balaji, who completed it in 1751 after Raja Shahu's death. It may be worthy of note here that the design of the entrance gate is exactly a copy of that of Indraprastha, the ancient Hindu capital of the Pandawas, in old Delhi. The Peshwas, being devoted Hindus, selected the design of the gate of Indraprastha, or Purana Killa, instead of imitating the magnificent gates of the Mogul capital. 1. Delhi Darwaja—as it faces the north. 2. 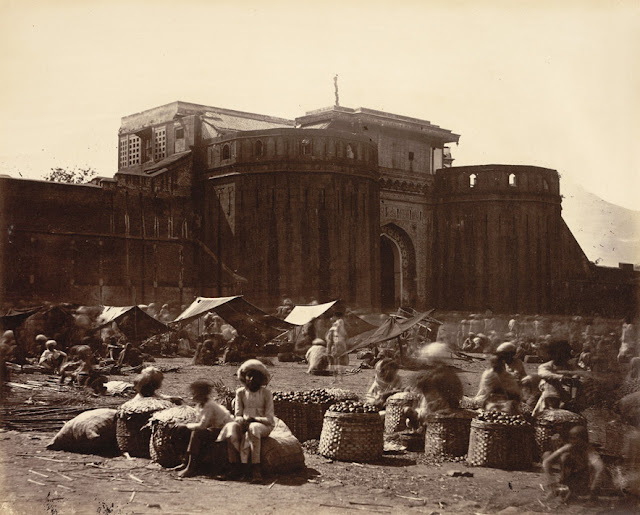 Ganesh Darwaja—as it was near the famous Ganpati Mahal. and founded the Banda State. 4. Khidki Darwaja—which was always closed and the entrance was open through a small window. This Darwaja is now known as ' Kavathi ' on account of a Kavat tree grown near it. 5. Jambul Darwaja—owing to a tree of Jambul. 3. Arse Mahal—Hall of mirrors. 4. Juna Arse Mahal—Old Hall of mirrors. 5. Dadasahebancha Diwankhana—Hall of Raghunathrao Peshwa. 6. Thorlya Rayacha Diwankhana—Hall of the first Peshwa. 7. Narayan Ravacha Mahal—Hall of Narayanrao Peshwa. Besides these, there were many other rooms and apartments assigned to dijierent members of the royal family and to several departments of the household such as Treasury, Store room, Record room, Library, Jewellery room, Armoury room, Medicine room, etc., etc. The vast household was well regulated and controlled, separate officers being appointed for the supervision and management of the Palace. There were regular guards and patrols placed inside and outside of the Palace. Great insight on the buildings inside Shaniwarwada. Wish we had an authentic painting or a photo before it was destroyed.